Jaipur, Jodhpur and Udaipur are three major tourism destinations in Rajasthan. All three famous for their many palaces and forts and lakes and hills, however, manages to maintain a very distinct flavour in the experiences that they have kept in store for you. They take you on a truly intriguing journey to the past that was enriched with the grandeur of a royal era, as well as offer you the green break that you require through their serene lakes and hills. And that’s not all; they also offer fun adventure activities to get your adrenaline rushing, ensuring you don’t spend a single minute idle while you are on your trip. The city of Jaipur got its name ‘Pink City’, when Maharaja Savai Madho Singh II painted the whole city in shades of pink, to welcome Prince of Wales, Lord Albert Edward, in 1876. Jaipur is the capital of Rajasthan. Jaipur, Delhi and Agra, forms India’s ‘Golden Triangle’, a much sought after tourist circuit. The other popular tourist destinations in the state can be easily accessed from Jaipur, making it a gateway. Apart from the palaces, forts, hills and lakes, what makes Jaipur truly quirky are the elephant rides and puppet shows – both, a very colourful experience. Taste the traditional cuisines to complete your experience of this city that upholds its culture in every nook and corner. Truly befitting the city’s ambience, start your day on a regal note by visiting the magnificent Amber Fort situated amidst hills, overlooking the Maota Lake. Amber Fort and Palace is about 11 kms away from the city. The unique aspect of Amber is its Indo-Islamic architecture. Apart from that, the many gardens, temples and courtyards are bound to, mesmerise you. Very close to the city is Hawa Mahal, also known as the Palace of Winds, which is also bound to take your breath away by its magnificence as well as structural design. This five storied building has about 953 windows, was built in 1799 by Maharaja Sawai Pratap Singh. Each of these windows adorns intricate designs. City Palace, with its gardens and other facilities, too is a major attraction in the city. Jantar Mantar, situated close to City Palace is a must-visit. The sculptures in the place have different astronomical purposes like predicting eclipses and keeping a track of the stars. 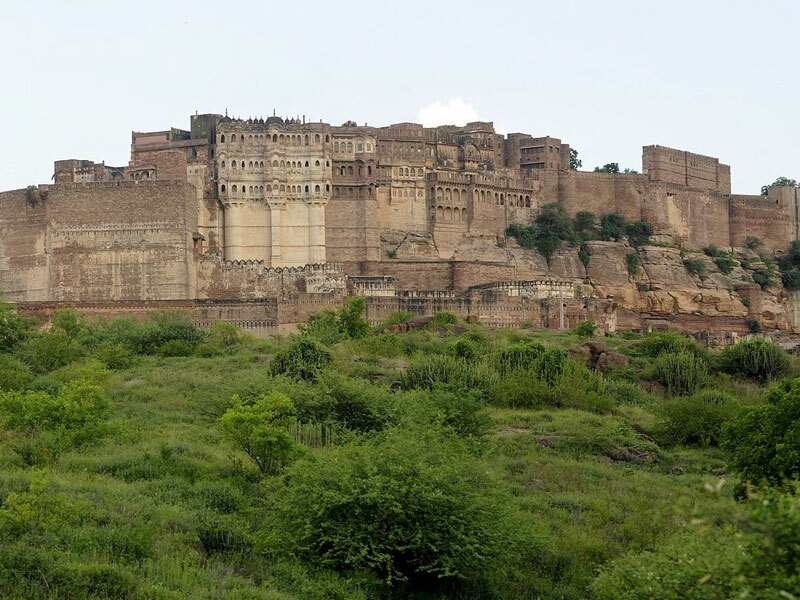 To understand more about the regal past, visit Nahargarh Fort, Jaigarh Fort, etc. You shouldn’t miss Jal Mahal, which serves to be a jaw dropping sight. This palace is located in the middle of a lake. The city is also replete with market spaces where you can buy items that are quintessential to the Rajasthani culture. Jodhpur is known by many names; such as the Sun City – because you can catch an early sunrise there, or the Blue City – because of the long stretches of blue houses that is a striking feature of the city. Jodhpur is situated in the Thar Desert. The city, founded by Rao Jodha in 1459, has majestic forts and palaces and many other adventure activities such as zip-lining and trekking to keep you enthralled. If you’re the one who gets intrigued by spooky tales and myths and folklore, you can start your day on that note by visiting The Mehrangarh Fort, one of the largest forts in India. The fort overlooks the stretch of blue houses. Built out of red sandstone, the fort, with high walls for boundaries is situated 410 feet above the city. After exploring the fort and the museum it houses, enjoy zip-lining with the Flying Fox Jodhpur, which is right next to the fort. The Rao Jodha Desert Rock Park, which was once a waste land, is now a park that attracts tourists to indulge in walks and trekking. Up next is The Jaswant Thada, a cenotaph built by Maharaja Sardar Singh. The cenotaph was build in memory of his father. Udaipur is royally beautiful with all its lakes, earning the name of ‘City of Lakes’, glorious palaces and wildlife sanctuaries. Udaipur was founded by Maharana Udai Singh II in 1553. The city is also known as as the ‘Venice of the East’. Rajasthan’s rich folk culture is marvellously portrayed through the many festivals which is a must-try. Head for the City Palace first thing in the morning after you set out. The palace, situated in the banks of Lake Pichola, has balconies, cupolas and towers that stand out in its architecture. City Palace is a mix of four major and other minor palaces. The next thing to do is go for a boat ride in the Pichola Lake, and visit Lake Palace, which is now transformed into a luxury hotel. The museum in Bagore Ki Haveli is the place to visit to get a good idea of the Rajputs’ lifestyle. If you have a thing for vintage cars, then the grounds of Garden Hotel is a paradise for you as it showcases an array of vintage cars that the maharajas once used to drive around. Shop for interesting handicraft and other quintessentially Rajasthani items at Shilpgram, and head for the Monsoon Palace to catch a beautiful sunset. You will be picked from the hotel by our executives and dropped at the departure point, and sent off with a bunch of memories as vibrant as Rajathan’s culture and warm like their hospitality.